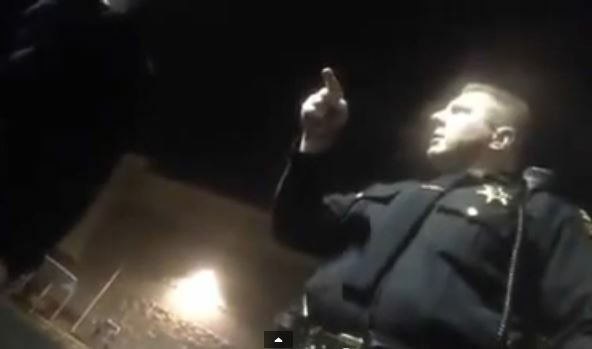 A New York deputy with the Saratoga County Sheriff’s Department was caught on film early Friday morning slapping a young man who declined to have his vehicle searched. Because these young men didn’t immediately bow down and lick the boots of the thugs with the shiny badge and magical costume that typically indicates supreme authority over the common folk. According to Adam Roberts, who spoke with Infowars after uploading the disturbing video to Youtube, he and his friend Colin Fitch were approached by two deputies while shopping inside a Walmart that evening. After being forced to present their IDs, the pair were taken outside to Colin’s vehicle and asked about a .22 rifle on the backseat. As Colin explained that he had just purchased the rifle earlier that day at a nearby store, a deputy Shawn Glans began demanding access to the vehicle, despite Colin proving that he was of legal age to own it. “So they started questioning us and were very ornery and asking about the gun and what not and then Colin asked him what we had done wrong and what he was charging us with and he didn’t give us a good answer,” Roberts said. Choosing to assert his Fourth Amendment, Colin told Deputy Glans that he would not consent to a search unless a warrant was obtained. After failing to coerce Colin into opening the vehicle, Deputy Glans became irate, ironically at the constitutional right he swore to uphold. “Let me see your f*cking keys… I’m searching your f*cking car,” Deputy Glans said, taking Colin’s keys against his will. Astonishingly, as Colin began to vocally protest the illegal seizure of his car keys, Deputy Glans responded by smashing the back of his head. Glans continued by unloading a stream of profanities at Colin for daring to defy his unlawful actions. Unable to find any illegal activity whatsoever, Deputy Glans ordered the pair to go home. Roberts says the video has since been shown to Glans’ supervisors, who suspended the deputy without pay while an investigation is carried out. According to Carlos Miller of Photography Is Not A Crime, Deputy Glans’ past is filled with reckless and violent behavior as well. In 1999, Deputy Glans was forced to pay millions of dollars after smashing head-on into a father of six while driving nearly triple the speed limit. The man, who had spent the last 14 and a half hours at work trying to provide for his family, was left so brain-damaged that he became blind and paralyzed, only able to move his left arm slightly. abuse, cop, jackboot, officer, pig, police, slap. permalink.